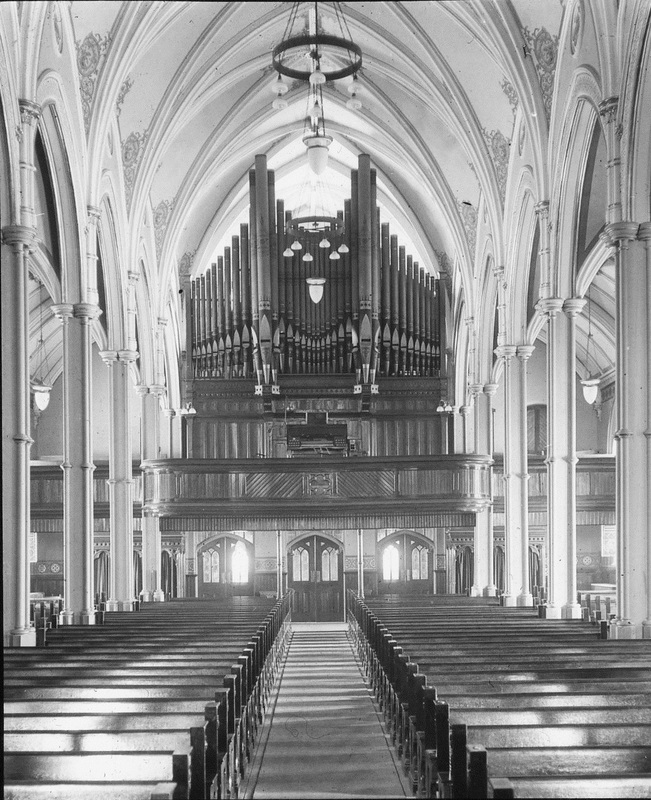 The current organ at Saint Basil’s was installed in 1919 by the organ firm Casavant Frères. It has been modified three times since its initial installation. 1960 saw the replacement of the original console for a then-modern console. Two years later, in 1962, minor additions were made to the organ by the firm Kney & Bright. The London, Ontario-based builder added mixtures on the Récit division, removed the Voix humaine 8’, and added a Chalumeau 4’ on the Positif. It would be another 19 years before the organ was again modified. This time, in 1981, the Toronto-based Alan T. Jackson Co. Ltd. undertook a tonal revision of the instrument, attempting as much as possible to bring clarity to the sound of the instrument’s otherwise generally dark tonal character. The goal of the 2017 restoration work was three-pronged and hinged on repairing and resolving any longstanding issues through visual, mechanical, and tonal enhancements. Thus was undertaken the most major rebuilding and restoration of the instrument since 1919. Mechanically speaking, several elements of the organ were releathered, including the Pédale offset chest and the primary distributeurs. The console was upgraded to include a pedal divider, as well as sostenuto functions (both additive and substitutive) on all divisions. A second organ was prepared for in the console, in honour of the original 1919 vision of the Basilian Fathers; the Basilians had conceived of the building of a second organ, operable from the same primary loft console. Though the second organ was never built, the mechanisms had been installed in the 1919 console to allow for the possibility to further enlarge the instrument by building a second, much smaller organ in the sanctuary, to complement the large loft organ. This work was left out in the 1960 console. The 2017 console work has now prepared for the possibility of a future addition of an Orgue de choeur, or choir organ, as was originally planned. Changes were also undertaken to beautify the visual qualities of the instrument. The Positif and Grand Orgue divisions were swapped and the central portion of the façade lowered, to expose the previously hidden rose window. The fading bronze-coloured façade pipes were stripped and repainted in a silver colour with gold mouths. Tonal enhancements were undertaken to give greater clarity to the sound. New pipework was introduced to the instrument, and other pipework restored to its original conceptual character. The French Romantic Cavaillé-Coll shallots gave the reeds their fiery sound, and the newly-voiced smooth foundation stops provided the symphonic character that the instrument has today. 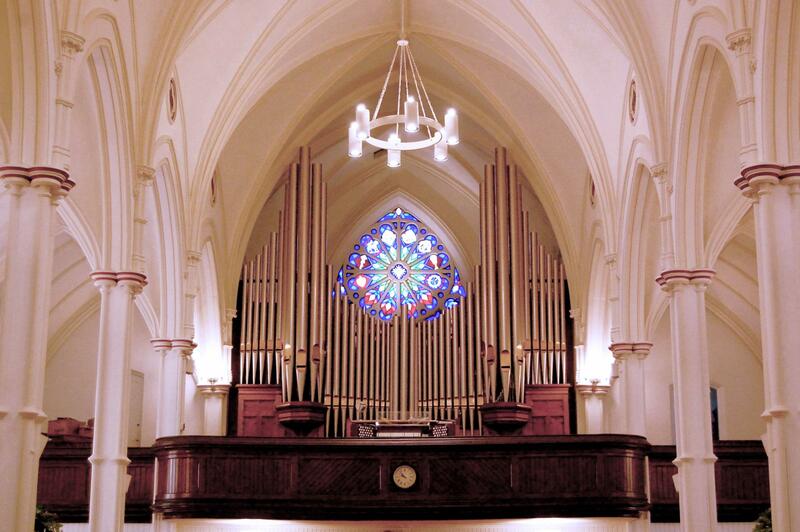 Currently, the organ has a total of 52 stops, 64 ranks, and 3,624 pipes. Full organ specifications can be viewed here.